Alps. When you hear that word you think of two things: Switzerland and the Matterhorn. I have always wanted to explore Switzerland in depth, especially because of my love for the outdoors, but the opportunity never arose. This month, I teamed up with Auto Europe to bring to you a road trip itinerary focused on locations that inspire. And, I must say, Switzerland has way too many locations that inspire! We picked up our rental car with ease at the Zurich Airport, and we were on our way! These are our “must see” destinations for all of you nature lovers! Keep in mind, you do need a rental car to complete this road trip, as this would be nearly impossible to do with public transportation, and you'd miss some stunning pull over spots. Leaving Zurich Airport, drive south to Lavertezzo. Our first goal was the Ponte Romano on the Verzasco River, which has the most incredible emerald green water! The bridge spanning the river is a beautiful sight. Constructed entirely of stone in the 17th century, it has a very unique feature — double arches. It also has a second name — Ponte dei Salti (Bridge of Jumps). Nearly forty feet above the river, it challenges daredevils to leap from the top of an arch into the deepest part of the river. Next we drove to Cascada dei Foroglio — an 80 meter waterfall in Val Bavona. It is a great sight, and several short, easy trails give you different perspectives. One takes you right to the base of the falls, where you can really experience the power of the water. Driving up this valley, we passed through a bunch of exquisite small villages whose structures were made entirely of stone. Not only is it the steepest and rockiest valley in the whole Alps region, but the small villages are only powered via solar power! 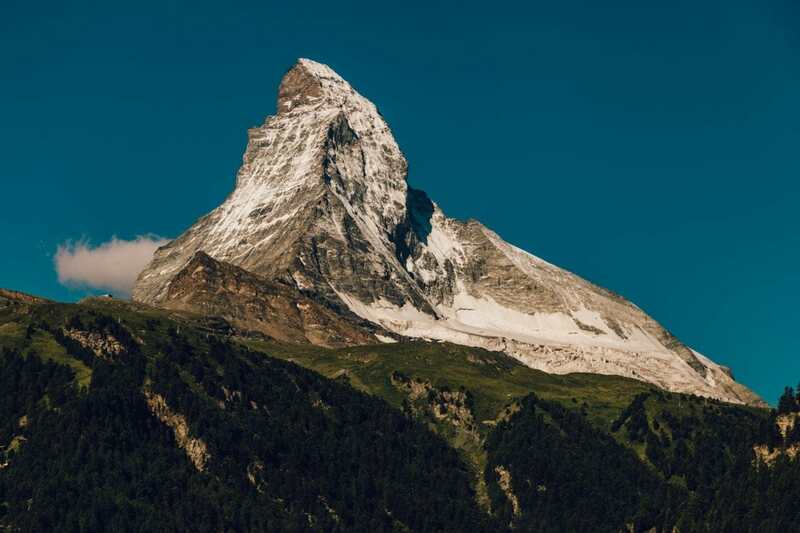 It was then time for us to see the Matterhorn with our own two eyes by going to Zermatt! The Matterhorn — undoubtedly the most famous of mountain images — staring back at you is … well, just awe-inspiring. Everywhere you turn you see a different beautiful peak. Purchase the Peak Pass, as this allows you access to all of the lifts and trains in the area. 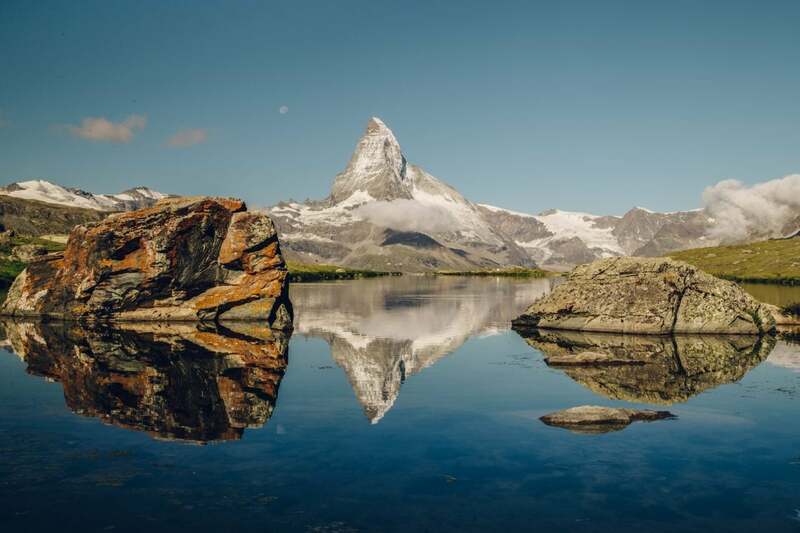 Be sure to check out Stellisee, the Matterhorn Glacier Paradise, Gornergrat, the Matterhorn Glacier Trail, and, of course, the Matterhorn Base Camp hike! Following Zermatt, take a step back in time in Montreux, located at the eastern tip of Lake Geneva. 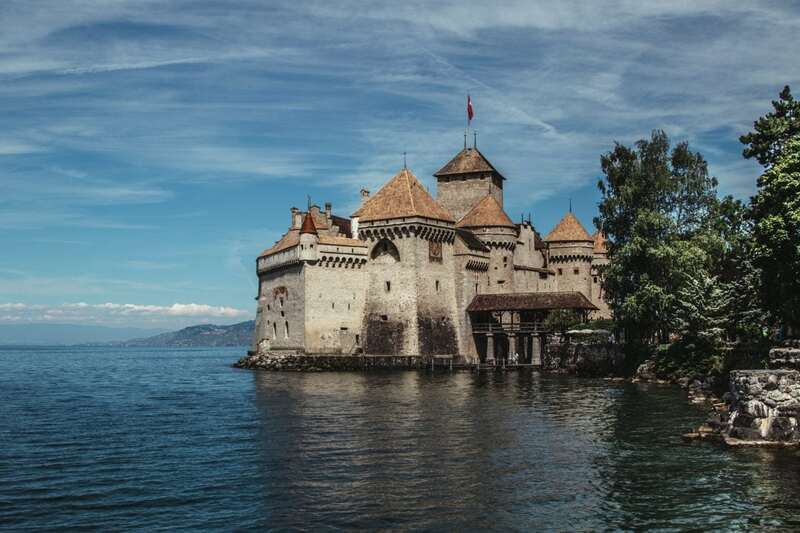 The lake itself is a stunning turquoise blue, but our goal was Chillon Castle. Built 900 years ago, it was an important strategic outpost in the region for nearly 800 years. A great restoration job has made it a fascinating stop. We gained a great sense of what castle life was like so many years ago for the rulers, the soldiers, the staff, and the prisoners. As its name suggests, Interlaken straddles the Aare River between two lakes — Thunersee and Brienzersee. 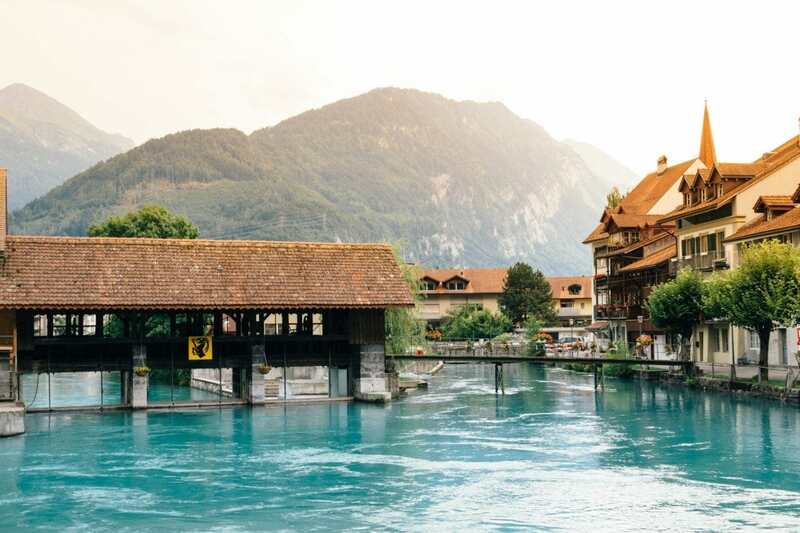 While the Old Town has some charm and the water color is beautiful, Interlaken is especially renowned as the adventure capital of Switzerland. Paragliders are omnipresent, and you can also hang-glide or canyon jump, and go canyoning, white water rafting, etc. You name it, they have it. And you definitely have to try it! 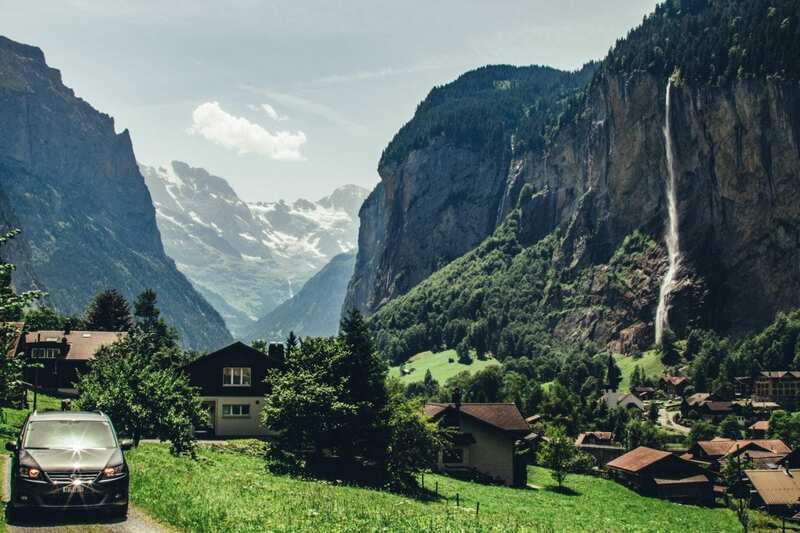 If you’re looking for a scenic drive through an alpine valley surrounded by towering snow-capped peaks with incredibly long waterfalls flowing down cliff faces, make your way to Lauterbrunnen! This scenic small town is the adventure center of the Jungfrau valley and is known for several awe-inspiring waterfalls visible from town (especially Staubbachfalle). It’s a truly delightful town. And that brought our incredible European road trip with Auto Europe to an end. We spent one final, lovely evening in Zurich (chowing down on the most amazing vegan food!) before heading to the airport early the next morning. By now, I’m sure you’ve learned that I love road tripping around the world, as it allows you the utmost freedom to explore and discover. I am absolutely in awe over the locations that truly do inspire in Switzerland, and couldn’t recommend road tripping with Auto Europe enough! 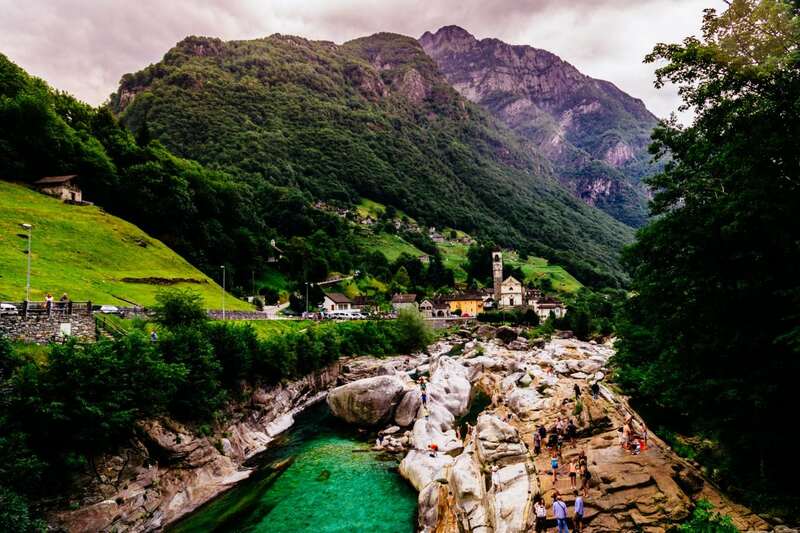 Interested in Road Tripping through Switzerland? Pin It Please! This article was made in collaboration with Auto Europe, and all photographs were taken by David M Gallo Photography. Wow! Every stop looks spectacular! This would make a perfect Tripidee trip! Yea the matterhorn is a spectacular mountain. Only wish I was brave enough/mad enough to give it a go. How amazing! I am actually from the area of Montreux! Glad you had a great time in our beautiful little country. I heard about you only yesterday… threw coach Nate Rio… how small is the world right? I’m looking forward to read more on your website. And who knows, maybe we can meet on your next swiss adventures (if you like hiking I’ve got loads of crazy beautiful places to show you^^). I’m in Switzerland now…it’s stunning! I will be in Zermatt Monday – can’t wait! Absolutely beautiful photos! Switzerland has always been my dream destination and reading your post makes me want to jump on the next flight to Switzerland right now. I wanna see the Matterhorn with my own eyes, too! 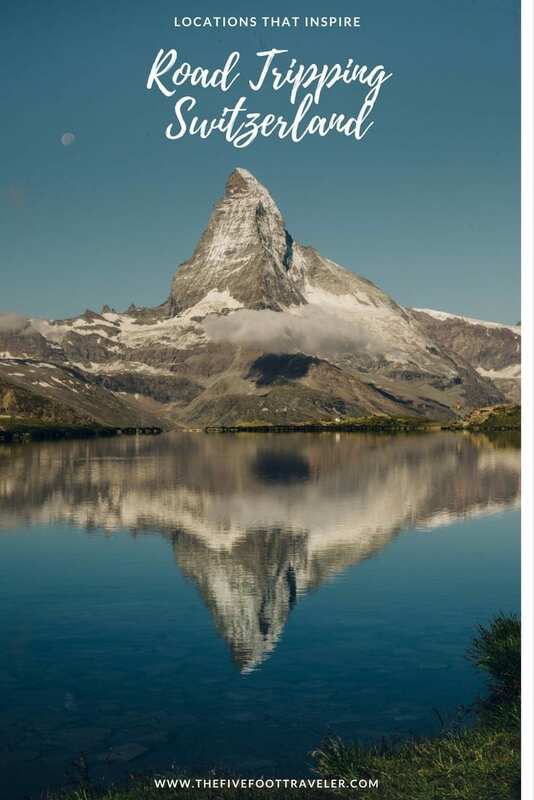 Seeing the Matterhorn is one of my biggest travel dreams! Thanks for the tips on other things to do along the way. Switzerland looks amazingly beautiful. I’m living so close to Switzerland (maybe to close) and I’ve never been in most of the places you listed in your post (except Montreux and Zermatt). Shame to me ! But there is so many other beautiful places to discover in Switzerland, right ? The beautiful region of Appenzell where traditional Swiss culture is still very much alive. Or the city of Lucerne and its lake… or a scenic hike through the vineyards of Lavaux ! 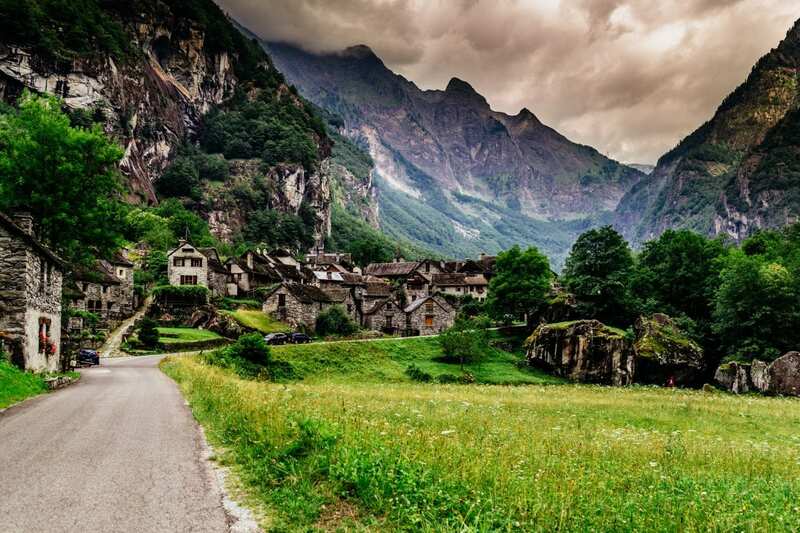 Switzerland is a land of charming stereotypes…..idyllic mountain meadows nestled below soaring peaks ! Switzerland really is a gorgeous country! We took the train throughout the country and then we stayed in murren, right near Lauterbrunnen. We could definitely do some more road tripping around that area!